Thousands of anti-government protesters marched through the Thai capital on Sunday, a prelude to a broader action next week when they say they will shut down Bangkok in their bid to scuttle a February election and topple prime minister Yingluck Shinawatra. The protesters, who accuse Yingluck of being the puppet of her self-exiled brother and former premier, Thaksin Shinawatra, want an appointed “people’s council” to oversee a vague reform platform, which includes electoral reform, decentralising power, and a volunteer police force, over a 12-month period before any future election. The crisis, an outbreak of turmoil stretching back eight years, began in November and has become a drag on the Thai economy. The baht slid on Friday to its lowest against the dollar since February 2010 and the benchmark.SETI stock index has lost 15 percent since early November. Yingluck, her brother and their support base among the rural poor in the populous north and northeast are pitted against protesters who draw support from Bangkok’s conservative, royalist elite and middle classes and the south. Protest leader Suthep Thaugsuban, a fiery former deputy premier from the main opposition Democrat Party, said marches would be held on Tuesday and Thursday, leading up the January 13 “shutdown”. That event is shaping up as the biggest confrontation since the latest round of largely peaceful demonstrations began. The protests at times have brought as many as 200,000 people on to the streets, but have also sparked sporadic clashes with police in which three people were killed and scores wounded. Sunday’s march began at Bangkok’s Democracy Monument, where some supporters had gathered overnight. 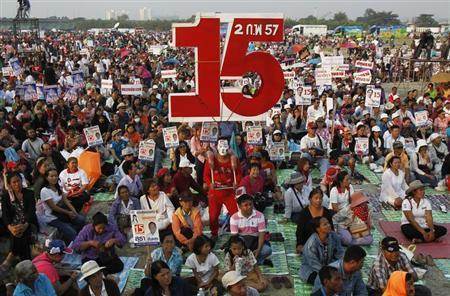 Suthep said the protesters would set up stages at five rallying points through the city leading up to January 13. Suthep was feted by whistle-blowing supporters, many of whom handed him cash as he shook hands and walked through the crowd. The protesters plan to shut down government offices in an attempt to force Yingluck’s administration to a standstill but, mindful of bloody crackdowns on similar protests, they have also said they will minimise the impact on ordinary Thais and will not target airports. The protests since November have been the biggest in Thailand since 2010, when mostly “red shirt” supporters of Thaksin tried to bring down a Democrat-led government. Those protests led to a military crackdown in which 91 people were killed. Yingluck has steadfastly refused to bow to the protesters’ demands and is determined that the election, which her Puea Thai Party is almost certain to win, will go ahead. “I admit that the election may not be a panacea to solve the problems immediately,” Yingluck said in a post on her Facebook page on Sunday. “But the election is the best medicine to help solve conflict under the democratic system. “I don’t want to see violence as it happened in 2010, or an economic crisis. We should not leave our children to inherit this conflict,” she said. The government has vowed to roll out 20,000 police and 20 companies of troops to maintain order during the protests. 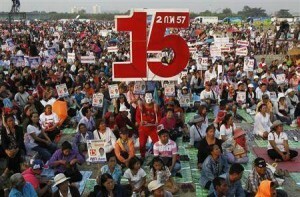 Concurrently, the “red shirts” have also promised to hold rallies outside Bangkok to counter the anti-government group. Thousands of Puea Thai supporters gathered in a Bangkok suburb on Saturday for the party’s official campaign launch. Pro-Thaksin parties have won every election since 2001, based on their support among the rural poor who have benefited from Thaksin’s populist policies such as cheap healthcare, easy credit and subsidies for rice farmers. The anti-government protesters accuse Thaksin of effectively buying their support and manipulating Thailand’s democracy, while also enriching his family and business associates. The first two years of Yingluck’s government had been relatively smooth until a blunder by her party in November, when it tried to push through an unpopular amnesty bill that would have exonerated Thaksin from a 2008 graft conviction he says was politically motivated. Thaksin fled into exile shortly before he was sentenced to a two-year jail term. Despite her determination to press ahead, Yingluck is looking more isolated the longer the protests drag on, with intervention by the judiciary or a coup-prone military always a possibility. Thaksin was ousted in a military coup in 2006.